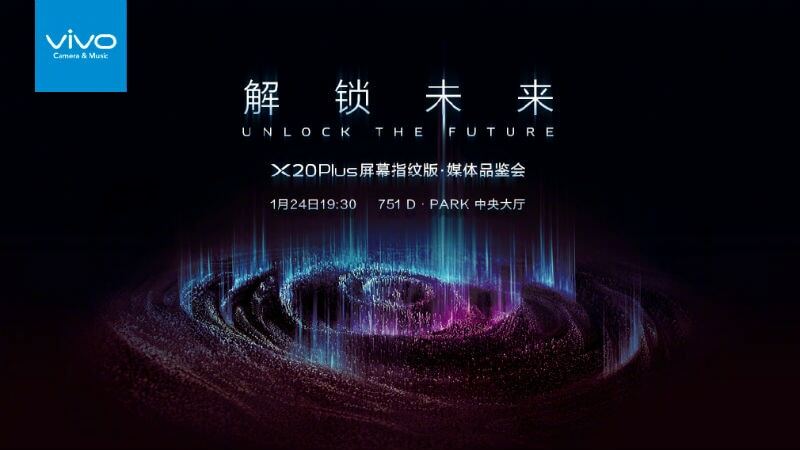 Vivo is all set to launch the much-awaited Vivo X20 Plus under display fingerprint variant on Wednesday, January 24. The launch was initially rumoured for January 25, but the Chinese company has now confirmed that the new smartphone will finally debut on January 24. The smartphone, featuring a Synaptics Clear ID 9500 optical under-display fingerprint sensor, recently received certification on Chinese telecommunications authority TENAA and was initially claimed to be called the Vivo X20 Plus UD. The Chinese company unveiled the world's first ready-to-produce in-display fingerprint scanning technology at CES 2018 in Las Vegas and showcased its existence on the original Vivo X20 Plusthat was launched in September last year. As per a couple of teasers released by Vivo through its official Weibo account, the company is hosting an event in Beijing, China, on January 24 to make the special announcement. The event will begin at 7:30pm CST (5pm IST, January 25). The teasers don't reveal any details about the specifications of the new smartphone. Nevertheless, the recent TENAA listing confirms that the new Vivo X20 Plus variant will come with a 6.43-inch OLED display with 2160x1080 pixels resolution. The online listing also points to the presence of a 2.2GHz octa-core processor, coupled with 4GB of RAM. We can safely assume that the processor is the Snapdragon 660 SoC that was featured on the original Vivo X20 Plus with the same top clock speed. Moreover, the smartphone is listed with a dual camera setup on the back - with 12-megapixel and 5-megapixel image sensors - and a 12-megapixel front camera. The Vivo X20 Plus in-display fingerprint version will come with 128GB onboard storage that will be expandable via microSD card (up to 256GB), as per the TENAA listing. The upcoming smartphone is also listed with a 3800mAh battery, Bluetooth, USB support, and 4G connectivity. Further, it appears to have 165.2x80.02x7.35mm dimensions, 183.1 grams of weight, and multiple colour options, including Black Gold, Champagne Gold, Rose Gold, and Matte Black. If we believe the ongoing rumours, the new Vivo X20 Plus version will go on sale in China with a price tag of CNY 3,998 (approximately Rs. 39,900). Synaptics had earlier claimed that as many as 70 million units of its in-display fingerprint sensors will be available this year. The new sensors are aimed to replace the available fingerprint sensor solutions, enabling fingerprint recognition under layers up to 1.5mm thick, including a screen protector.